The first problem was that we couldn’t actually find the lake. 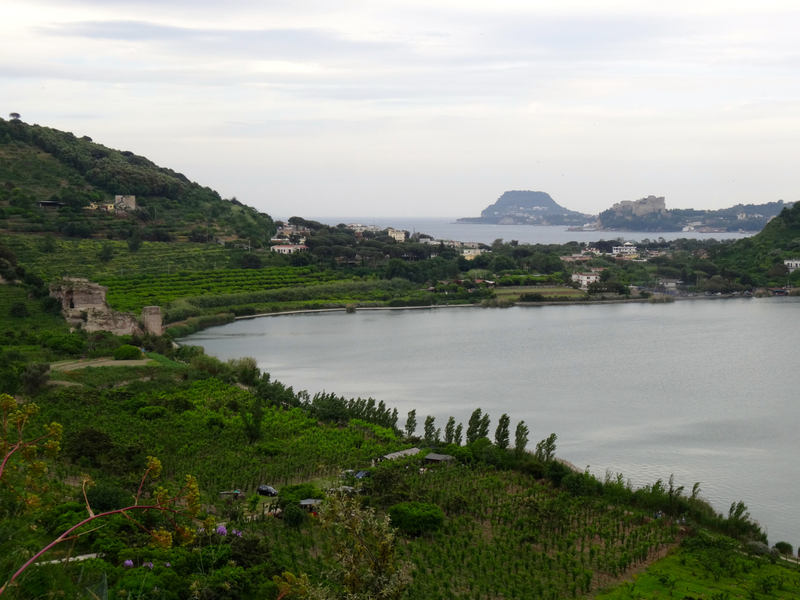 We could see it from above with a view down through vineyards to its cup of water, and we could see beyond it – right out across the sea to the Aragonese Castle at Baia, and on to Capo Miseno. We could see all of that … just not the way down. But the pause was worth it. From where we stood on the edge of the road that runs above the lake, we could see the geography that linked into the history, and we could feel the connections. Since that first view I’ve opened my mind a little wider and wondered about two men, opposite in nature – Agrippa, man of action, and the other, the Roman poet Virgil. Both of these men studied Lago d’Averno and then linked together some very different, but powerful possibilities. Agrippa, Marcus Vipsanius Agrippa, was the Roman general who served Octavian with distinction through the chaos of conflicts that followed the assassination of Julius Caesar in 44 BC. Part of Agrippa’s role then was to build up the strength of the Roman navy. He did much of this in in the safety of the lake below where we stood that first evening. The lake was deep enough and, at several kilometres in circumference, big enough, to hold his ships. It became part of his ‘Portus Iulius‘. It’s easy to see Agrippa’s reasoning … so long as you think big. Lago d’Averno is tucked behind the smaller Lago di Lucrino which lies between it and the sea. This location gives it an advantage and a disadvantage. On the one hand it’s hidden and difficult to attack from the sea; on the other hand getting ships back to the ocean is not straight-forward … unless you’re Agrippa. His solution, in 37 BC, was to build a canal to link his port though its neighbouring lake, Lucrino, and on to the coast. It worked. 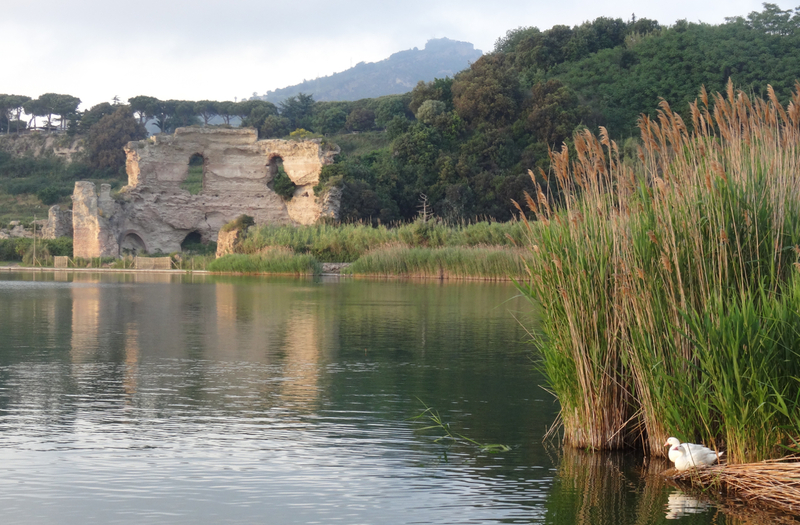 He also tunnelled through the volcanic cliffs behind the lake to Cumae. This meant his sailors were connected to a Roman hub on one side of the lake while, on the other, they linked out to the world beyond, via the sea. Agrippa carefully cocooned and prepared his ships for several years, then, six years later in 31 BC, they were tested in the brutal naval battle of Actium between Agrippa’s boss Octavian, and the forces of Mark Anthony and his Egyptian queen, Cleopatra. In the end Octavian won and it proved to be the crucial victory that would earn him the title of Roman Emperor, and the name Augustus. It was also the victory that pushed the Roman navy up Rome’s power list alongside, of course, Agrippa – the man who helped to build it. In the nearly two thousand years since then Mother Nature and man have stepped in. 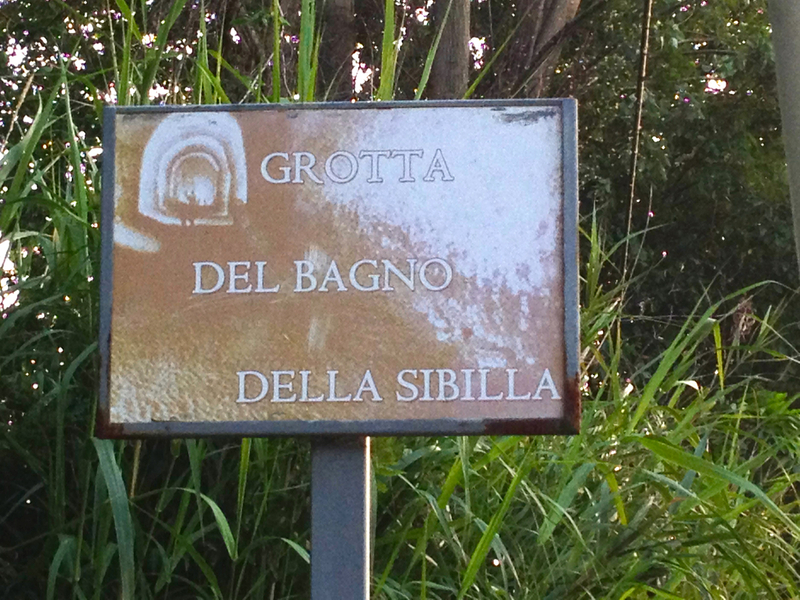 Bradyseism, the sudden up and down movement of the earth, swallowed Agrippa’s canal fairly swiftly and forced his navy up to Capo Miseno, and World War II did for the usefulness of the Grotta di Cocceio, the tunnel that linked Lago d’Averno to Cumae. Virgil’s Aeneid on the other hand is still going strong. 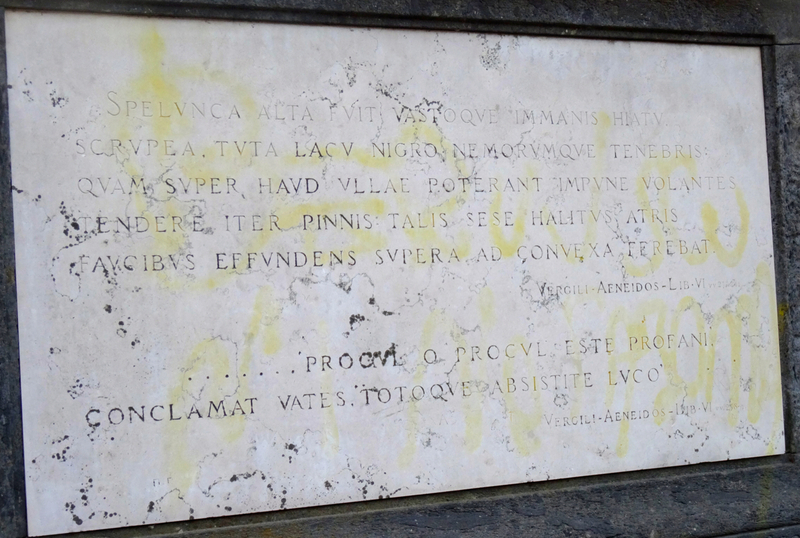 Publius Vergilius Maro, Virgil, was well-educated and originally from Mantua, although he spent much of his life near Nola, not far from Cumae. He was born in 70 BC, about seven years before the birth of Agrippa and Octavian. All three were young men when Julius Caesar was assassinated in 44 BC, and all three went on to play major parts through the bitter confusion that followed. Past Romans, and today’s academics, honour Virgil for his command of words and his understanding of the powers of his time and their impact. His epic, twelve book poem, the Aeneid, written in Latin between 29 BC and the year he died, 19 BC, is probably the best known of his works. The poem is still studied today and the name Virgil gave to Lago d’Averno, widely translated as the ‘gates of hell’, is still remembered. It’s on the edge of this lake, that Aeneas, the hero of Virgil’s poem, meets the great prophetess, the Sibyl of Cumae, who tells him how to gain entry to the underworld where he hopes to find his father and the answers he needs. It is a legendary meeting. That first evening early this summer we peered down from our viewpoint towards the entrance to Virgil’s underworld. 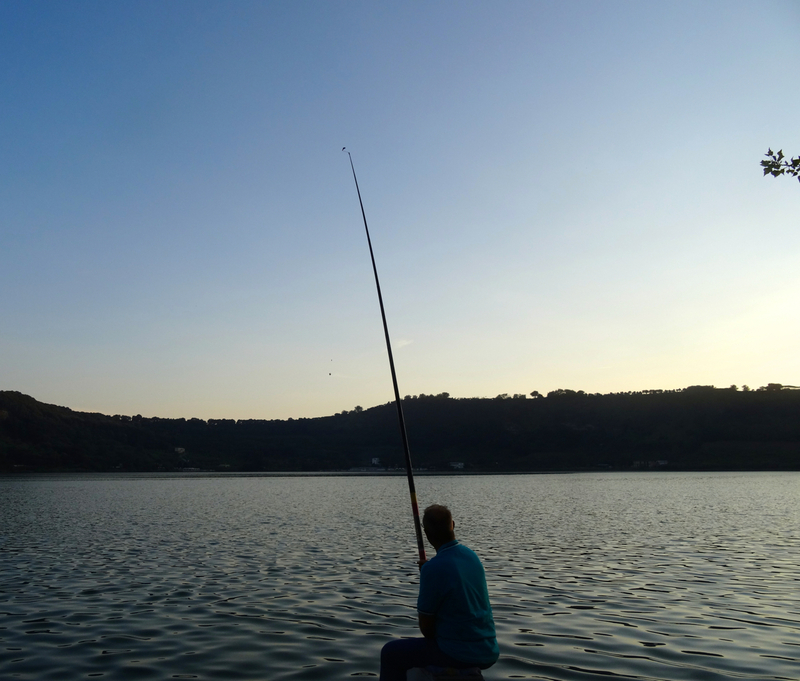 There was no sign of turbulent emotion – Lago d’Averno looked calm and deep. The only connection we could truly make with the challenge Virgil gave Aeneas was difficulty of access. So close to the footsteps of such a hero we could not give up. After all Aeneas had to face a mission with numerous hazards … as well as to understand and foretell the greatness of Rome. All we had to do was walk the dog. So we bumped our way around various traffic systems until eventually we did find the single road, a bit like Agrippa’s canal, that links the sea shore to Lago d’Averno. The road, which circles half the lake, is paved with black slabs and occasional restaurants. 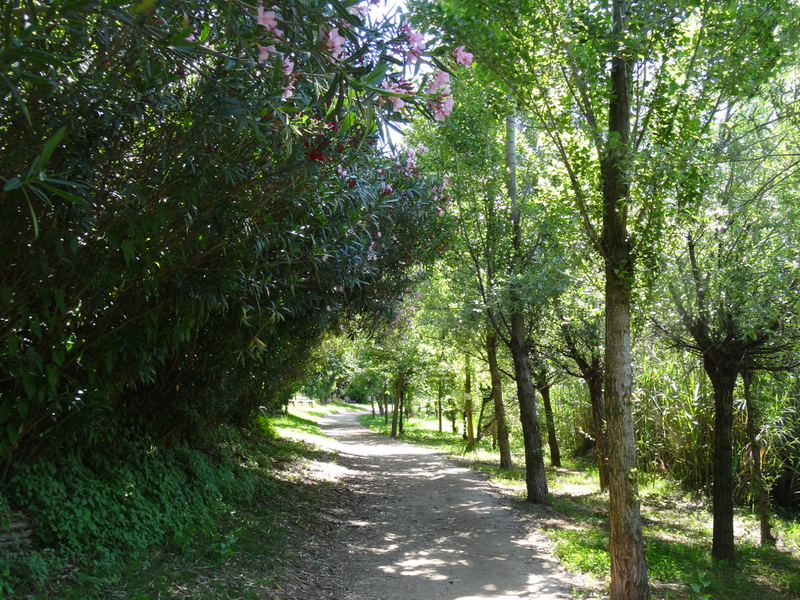 On the second half it’s joined by a wide dirt track that passes beneath oleanders and fishing spots. Around the lake there are faded signs that remember the Aeneid. There is also a light-catching ruin whose brickwork pays tribute to the Romans but there is no sign of Agrippa’s ships, Virgil’s sibyl or Aeneas. They have all gone … but the birds are back. 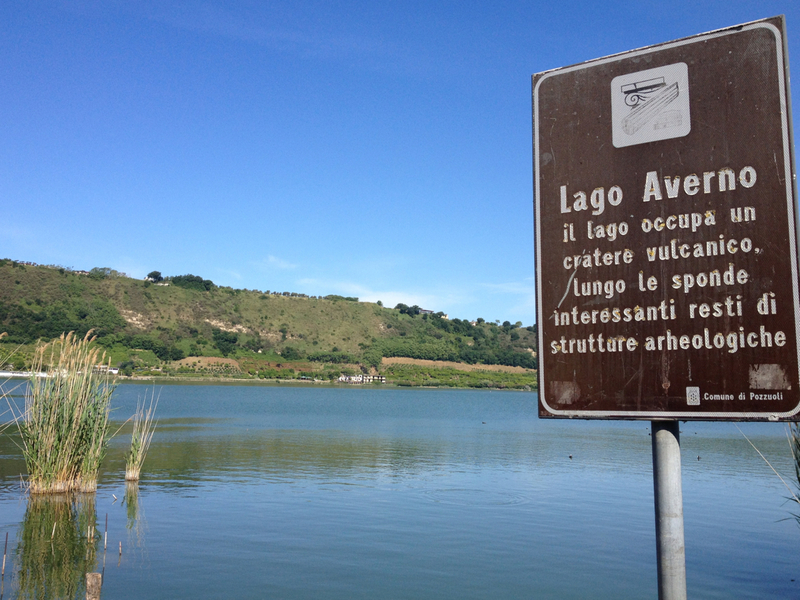 Apparently Lago d’Averno used to be a no bird area – the name Avernus comes from the Greek άορνος meaning ‘without birds’. 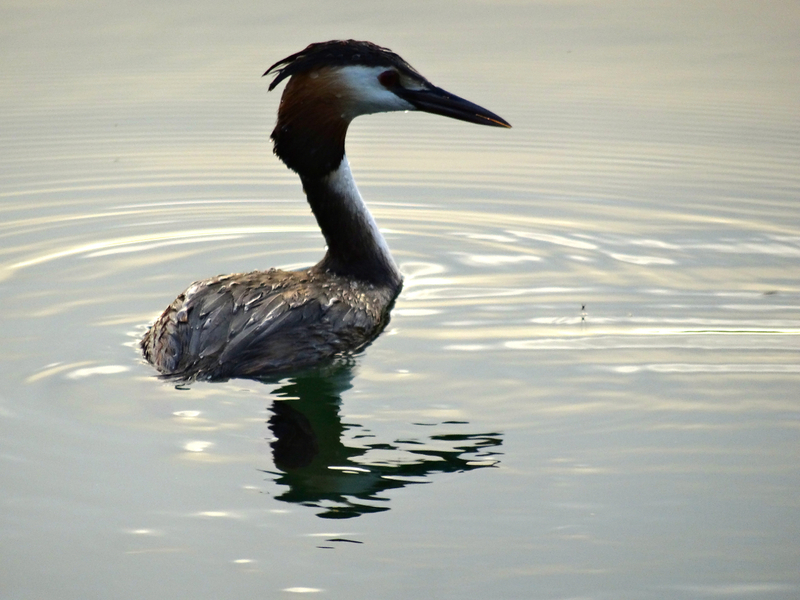 It’s thought today that the air above the lake must have been so recently volcanic, so full of sulphur, that birds could not fly. Today orchards, vineyards, flowers, walkers and dogs, jumble, relaxed, along the edge of the lake – a celebration of the best of Parthenope. Virgil would be pleased … I’m not sure about the man of action, Agrippa. 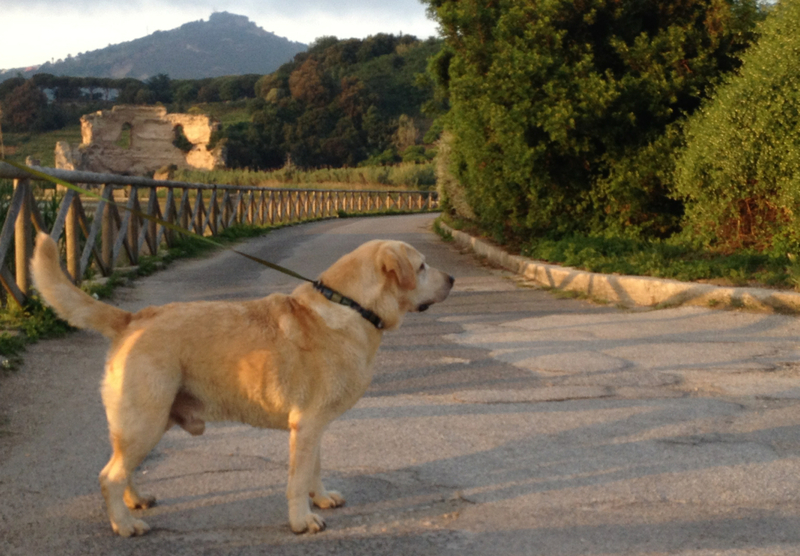 As for the dog, our informants were right, Lago d’Averno is perfect. This entry was posted in Campania, Italy, Lago d'Averno and tagged Actium, Aeneas, Agrippa, Baia, Capo Miseno, Cumae, Julius Caesar, Lago d'Averno, the Aeneid, the sibyl, Virgil. Bookmark the permalink. 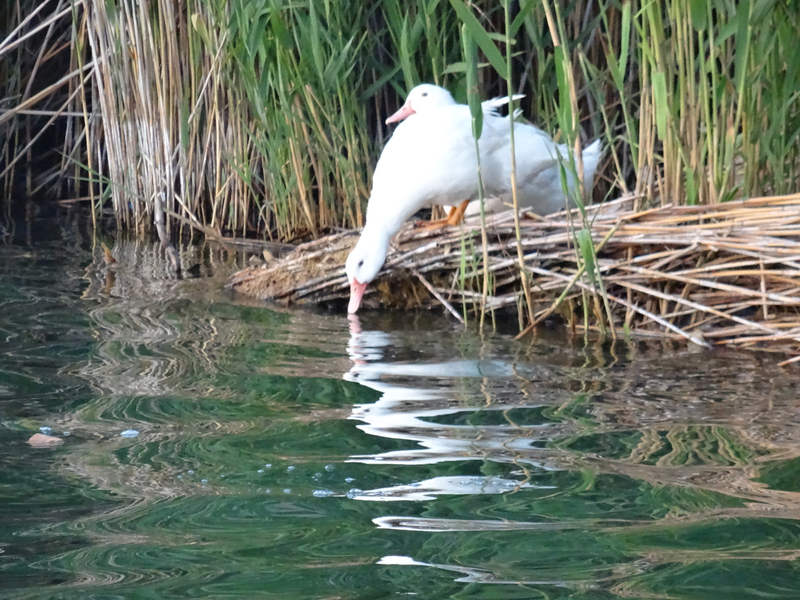 Thanks for the comment – it is a lovely oasis! 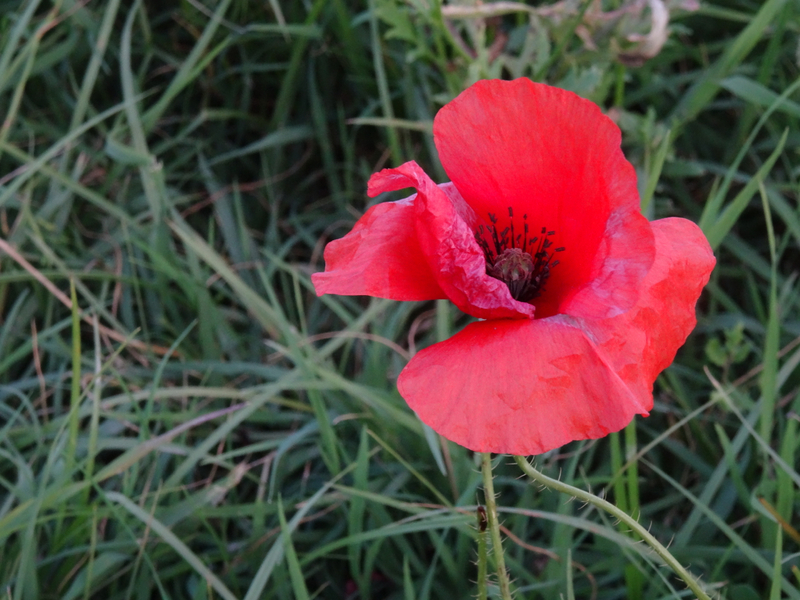 You paint a perfect picture of both the history and the feel of the place – which took me three goes to find as well! Thank you – wonder if you’ve seen the view of Lago d’Averno from the volcanic ridge of Carney Park? Worth the hike if you haven’t. Great article! I wasn’t so lucky a year ago and had to quit without finding the famous lake. I’ll try again next year. Hi – thanks for your comment! So glad you’ll have another chance next year to seek out the lake. Thank you so much for this article & great photos! My brother & I shared many adventures around the edge of this lake with our dog when we were young! We could walk there from our house when we lived in Naples in the early 70s. I loved seeing it from a more adult perspective. It is truly a magical place. Brillaint article and you really captured the history and beauty of the place.